Are you excited about the new Ray Tracing Supported GPUs from Nvidia? The concept of ray tracing has been there since quite long enough. But, the recent announcement of new age graphic cards by Nvidia that employ ray tracing technology has been one of the reasons why we hear more about it. With the current range of video games offering high-quality performance regarding texture, resolution, light effects and visual effects, it has been utterly essential to go with advancement in video technology. What exactly is Ray tracing and how is it expected to change the way we worked with our videos rendering is what we would attempt understanding. What is Ray Tracing Technology? Simply put, ray tracing is a rendering technology. It excels with the true to life imagery with the realistic rendering of shadows and lights. It will offer you completely realistic objects, and it accurately simulates how does the light interact with the objects and simulates everything as if it is happening in the real world including reflection, refraction, and absorption of light. Using it in real life situations for your games may not be practical. A game running within the compact device may not indeed be capable of handling this kind of high-level rendering. That was the case so far. Now, Microsoft, Nvidia, and AMD have made announcements that indicate the possibility of getting the real-time ray tracing functionality into games. This should be great news for the gamers out there. The implementation of an immersive gaming and exciting graphics effects are what would make it a great option making the games more lively and enticing. Once implemented, you can expect a lot of reflections in the gameplay throughout the maps. Ray tracing is a rendering technique that can be capable of producing realistic light effects. The ray tracing technology makes use of an algorithm that would trace the light path and then use it to simulate the exact way that the light would interact with the real world objects. Ray tracing technology is more about how light interacts with the surroundings rather than about the light itself. It is more like the real-life interaction of light with an emphasis on lifelike shadows, reflections, refractions and absorption of light. It follows the way in which the human eye processes the light. Ray Tracing makes use of the enormous computational power and the technologies available at the standards of technology. The images produced would be completely equivalent to what you would be witnessing in real life. How does it Differ on Video Games and other Media? 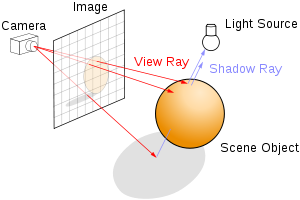 The Raytracing technology has been widely used in the development of computer imagery for the movies and TV shows. That would be entirely possible for the studios as they can have the power of server farm or cloud computing to implement the ray tracing technology. Replicating the same technique on a gaming device may not be as easy as it may appear to be. Video games will thus make use of a process called rasterization. The rasterization is a process that makes it a speedier method for rendering your computer graphics. The rasterization process converts the 3D images into 2D so that they can be displayed on your screen. The process then makes use of the shaders to transform any 2D images to depict lifelike images with the proper shadows and lights. What are the Developments Currently on in Ray Tracing? One of the big players in the realm of Ray tracing is Microsoft. It has already announced DXR or DirectX Raytracing as part of the DirectX 12. You will be able to compute and create rays, and thus developers can take it forward to experiment with what they can provide with their video games. Microsoft has been working with several players in the genre of video games. Electronic Arts and Unreal Engine are a couple of developers working with Microsoft. Given the fact that ray tracing is dependent upon a massive amount of GPU power, you can expect the graphics card manufacturers are jumping into the Ray Tracing bandwagon. Nvidia is leading the pack of GPU developers and has already developed the technology based on the Ray Tracing specifications. Dubbed as RTX, the technology is being used in its new range of workstation and consumer-oriented graphics cards. They have also been working with Microsoft with the help of their DXR technology. Then, there is AMD. They have not yet made any announcement as yet like Microsoft or Nvidia, but have nonetheless made their intentions of implementing ray tracing clear. They will be applying the ray tracing technology through their ProRender rendering engine and Radeon GPU Profiler 1.2. However, they do not appear to be focussing on the games as such. Well, as things stand as of now, only Nvidia has announced new graphics cards that would work with Ray tracing technology. They have recently announced the launch of RTX 5000, RTX 6000 and RTX 8000 GPUs for their professional lineup. These will be RT cores – meant explicitly for Ray Tracing – along with the CUDA cores used for computing and Tensor cores which are used AI rendering. Nvidia claims that the Ray Tracing support will improve the rendering by 25 percent. The Nvidia RTX 5000, RTX 6000 and RTX 8000 Graphics cards will be made available by the end of the year. These processors form part of the workstation class and have been announced in August 2018. We would expect the launch of consumer level graphic cards with ray tracing technology quite soon. Ray Tracing is one of the unique concepts in the realm of the graphics cards arena and has been the huge selling point for Nvidia and its wide range of graphics cards supporting the new technology. However, AMD seems to be planning to take on its beta noire with the focus on the ray tracing technology. Of course, there is an official announcement about the new range of AMD GPUs with the ray tracing technology, but AMD has been thinking differently, along with the lines of Nvidia, that is evident from a few ideas shared by the team. AMD has understood the importance of ray tracing and its effects on what will power the graphics cards in the days to come. That should ideally explain its attempt at enhancing the support for Radeon Rays which is a GPU accelerated ray tracing development software. The Nvidia line up of graphics cards has been getting a serious competition if the news reports from AMD holds true. AMD is planning to make use of the 7nm GPU architecture for taking head-on the Nvidia GeForce cards and planning to bring ray tracing with it. What’s the View of AMD on Ray Tracing? AMD has always maintained that the Ray tracing technology is not a big deal. When the technology was launched with GeForce RTX series by Nvidia, AMD claimed that the ecosystem is not yet ready for it and it may be too early to launch the technology. The fact remains that there are a limited number of titles available that support ray tracing. Even Nvidia had to wait till Microsoft launched the October 2018 update to Windows 10 before it could extend the support for DirectX. As AMD CEO Lisa Su aptly puts it, “ …we’re working very closely with the ecosystem on both hardware and software solutions and expect that ray tracing will be an important element especially as it gets more into the mainstream, frankly, of the market.”. The recent announcement for the widened support for Radeon Rays should ideally indicate a positive development in AMD towards achieving the ray tracing compatibility on its newer range of GPUs. Radeon Rays are specifically targeted for the content developers who are looking to make use of the high-performance ray tracing capabilities with the AMD range of GPUs, CPUs, and APUs. Unlike the ray tracing mechanism that relies on the DirectX ray tracing API from Microsoft, Radeon Rays are designed to work as an open source functionality. That would ideally make it one of the best options to work with even the non-AMD hardware as well. AMD will provide the dev-kit and thus has more robust capabilities of its implementation. However, there are also plans to introduce real-time GPU acceleration with ray tracing with its ProRender release which has been included and built into the Vulkan 1.1 API. Enhanced support for geometry and ray masks. What does the future hold for AMD ray tracing? AMD believes that Ray tracing is a compute problem. From that perspective, Radeon Rays technology capably handles the task. It helps you accelerate the BVH ray tracing functionality. Of course, it does not reach the level of the performance offered by the hardware dedicated ray tracing. However, the plans set ahead by AMD indicate to doubling the compute power and bringing in more efficiency to the ray tracing capabilities on the AMD GPUs. There are no announcements about the new range of GPUs with support for Ray tracing as of now, but the options are bright. The use of multi GPU technique and the new Navi architecture being launched later in 2019, we can expect the graphics cards with advanced ray tracing capabilities. We consider the technique from AMD quite practical. Now that it is only Nvidia that has been showcased the ray tracing technology, it does not own it. The functionality runs on the third party API, in this case, Microsoft’s DXR. If AMD can keep its ProRender engine developed enough for the professionals out there, they can come up with a capable performance with its graphic cards with ray tracing technology for the next generations of the ray tracing technology. That brings us to the development of AMD Radeon ProRender engine. The powerful engine is built on the Radeon Rays technology and focusses on the creation of the photorealistic images. The engine is equipped with the complete and scalable ray tracing technology and offers it open source. The technology is aimed at harnessing the power of your GPU and CPU for the swift and impressive results. We would expect to be the driving force in making the AMD GPUs and CPUs and work towards making it one of the excellent choices when AMD is ready to launch its ray tracing GPUs in the future. AMD is not sharing any information directly with us, but we are sure it understands the importance that ray tracing technology carries in the realm of high-end gaming and would like to believe that they are into the backend development and will come up with their game plan by the time ray tracing enters its second generation of product development. Well, if you are looking for the new range of AMD GPUs with the ray tracing compatibility, you may need to wait till AMD decides to provide us with the best options concerning the ray tracing GPUs. 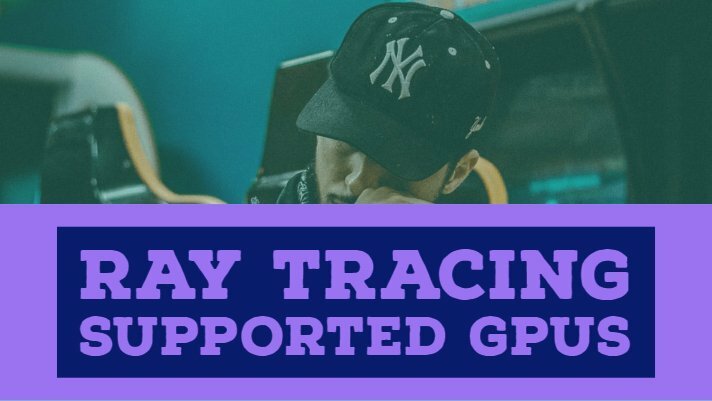 As things stand as of now, there are no GPUs that come with explicit support for Ray tracing technology. However, the back end development of the ProRender engine and the focus on Radeon Rays 2.0 as an open source option can herald the arrival of the new range of GPUs with ray tracing capability built into the hardware soon. Till that time, you may need to be dependent upon the developers who will offer the compatibility on their titles, thanks to the efficiency provided by Radeon Rays technology which is one of the prominent open source ray tracing engine from AMD. Let us wait for the further development and update you here as soon as the new ray tracing GPUs are made available from AMD. That was what we have concerning the Ray Tracing technology for now. From the discussion we had so far, it should be evident that the technology will erase the fine line between the virtual world and the real one from the gaming point of view. The technology is still developing. However, with the support of the big players like Microsoft, AAMD and of course, Nvidia – we would foresee a good deal of development of the technology in the days ahead. Previous PostSamsung 960 vs 970 Evo Nvme Spec Comparison - Whats the difference?